The tick – bloodsucking antropods that love to feast on hillwalkers and their dogs and can carry potentially dangerous diseases. They live in long grasses and wait for their target to walk by before leaping onto exposed skin. Here in the UK and Ireland, ticks are often found on sheep, but can feed on any animal such as mice, birds, deer and farm animals, so it is not hard to imagine that they are more common than you think. It is especially common in the Western areas of Ireland such as Connemara. Like a lot of things it is better to prevent the tick bite in the first place instead of having to remove it. 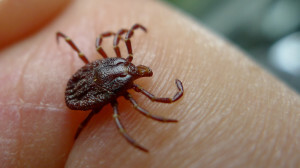 If you do have to remove it, there is great advice by TickTalk Ireland which can be found on their website, along with more information regarding preventing Tick bites from veterinarian Lawrence Swift, who also gives advice on removing Ticks from animals. The following information on how to prevent tick bites comes direct from Tick Talk Ireland who are experts in all things Ticks. Wear long sleeved t-shirts and trousers. Tuck your trousers into socks or boots and tuck shirts into trousers to minimise the chance of ticks getting to exposed skin. Wear light coloured clothing to make any attached ticks easier to spot. Check yourself and children every couple of hours for attached ticks. Apply insect repellent with 20%-30% DEET to any exposed skin. Can also apply Permethrin to clothing (do not apply directly to skin) which can be bought in camping or hunting shops. Avoid wooded areas with tall grass and try to stay in the centre of trails to avoid tree branches, leaves and long grass where ticks usually lie in wait for an unsuspecting victim to brush past. Once home check your entire body for ticks. Important areas to check are behind the ears, inside the outer ear, under the arms, behind knees, the trunk of the body and the scalp. If you find any ticks remove them. For information on removing a tick safely see our Safe Tick Removal page. The most effective way of removing a tick is the Tick Twister. Thank you so much for raising awareness, prevention is such a key thing. If anyone does come across a tick or three in Ireland we have an on going survey that you're all welcome to fill in. We also have a survey for anyone who have sadly succumbed to Lyme disease - many are shocked to lean that Lyme has been around in Ireland for centuries (Prof Gray published papers in the early 1990s) plus studies have shown the bacteria has been around, in Europe, since the ice age - eeks!